DuoBase Bench Stone Accessory can be used with ALL DuoSharp® and Dia-Sharp® Bench Stones, and any 6" x 2" Diamond Whetstone™. Provides 2" knuckle clearance for ease of use. This model offers a MagnaBase Adapter™ to accommodate Dia-Sharp bench stones. Rubber feet secure the base and stone to the work bench or counter. Features a convenient handle on the underside for use with the DuoSharp bench stones for moving the stone over a large work piece for maximum versatility. Do not use this feature with Dia-Sharp bench stones. Durable construction will provide years of consistent performance and reliable service. For proper tool maintenance, woodworkers, chefs and other professionals rely on the superior quality and versatility of DMT® products. Made in USA. 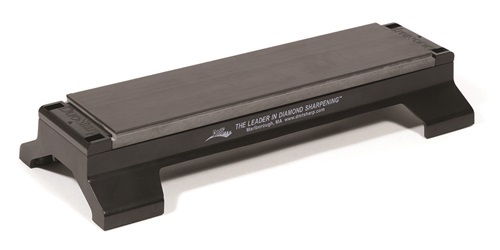 A 'must have' accessory for any DuoSharp® and Dia-Sharp® bench stones, and any 6" x 2" Diamond Whetstone™. Features convenient handle on underside for moving stone over large work piece with the DuoSharp bench stone. Not for use with the Dia-Sharp bench stone.